Highly complex functions versus super-easy usage and read-off: Bulgari reconciles apparent opposites in its new HORA DOMVS watch, a multi-timezone timepiece that provides an exceptional city display in two spacious apertures. A single pusher serves to synchronise the multiple functions that make HORA DOMVS a benchmark “worldtime” model. This creation represents an authentic travel instrument that meets the needs of contemporary nomads. Humankind must return to the centre of a world that has become a global village, driven by technologies with the ability to shrink space and time. HORA DOMVS from the Latin “Home Time” meets this demand. 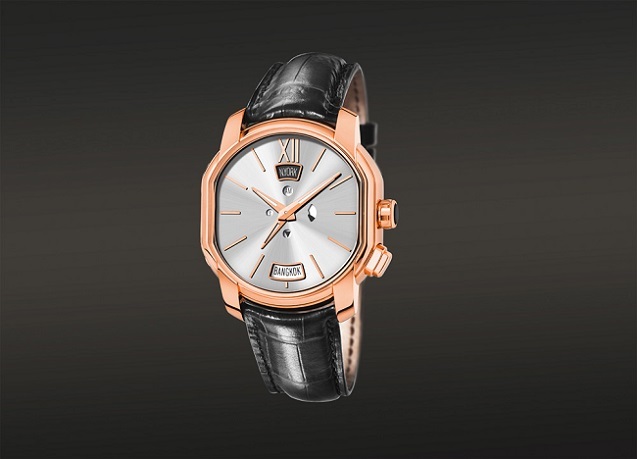 This classic yet innovative watch is equipped with a Manufacture-made movement endowed with an original multi-timezone complication that is astonishingly user-friendly. HORA DOMVS lends a more familiar touch to being elsewhere and almost magically brings far-flung places within reach. Enabling easy read-off thanks to its pure, uncluttered dial, HORA DOMVS provides a precise response to the real needs of frequent flyers, including the ever-growing population of professional travellers. Having selected the destination city of a given journey via the 4 o’clock pushbutton on the caseband, globetrotters can view its name through the aperture pointed to by a dedicated arrow. The corresponding time is indicated by a solid hand, while home time remains permanently visible via the small cut-out hours hand. 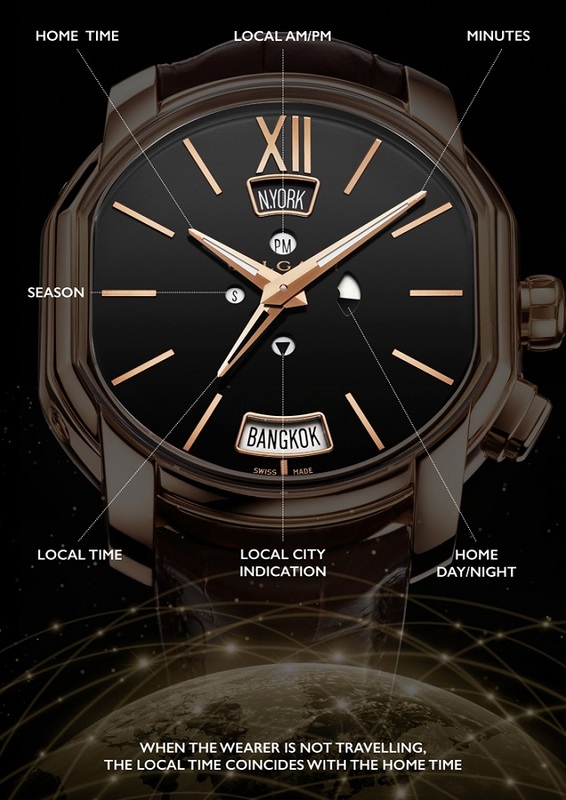 Bulgari has chosen to go even further by providing a sophisticateddisplay taking account of information such as the season (summer/winter time), as well as day/night or morning/afternoon differences. Despite this comprehensive range of indications, the functions remain extremely simple to use in that they are all coordinated via the pusher. Activating the latter synchronises all the information relating to both home and travel times. When the wearer is not travelling, the two dedicated hours hands remain mysteriously superimposed. HORA DOMVS is equipped with Calibre BVL191, developed and produced by the Manufacture de Haute Horlogerie Bulgari in Le Sentier and enriched with a module produced in-house. This mechanical self-winding movement, with its balance oscillating at 21,600 vibrations per hour, measures 28.30 mm in diameter and 8.55 mm thick. 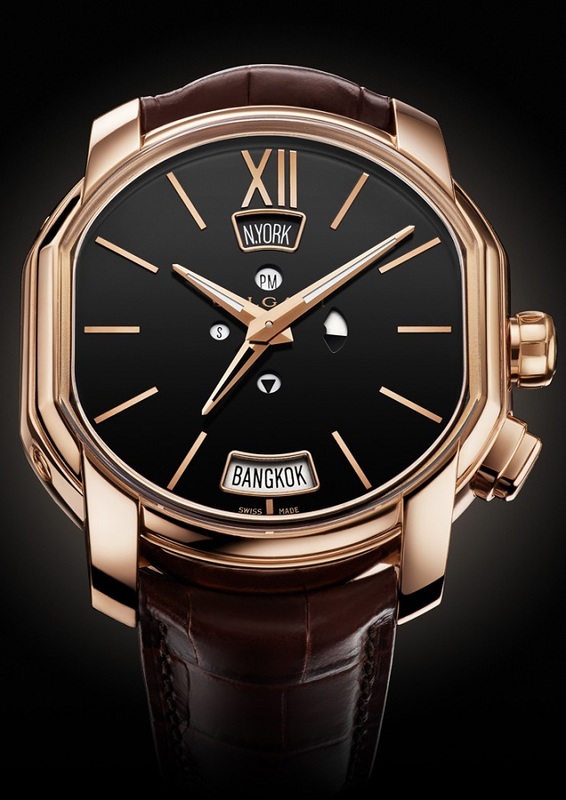 It is housed in an 18K pink gold double ellipse case. HORA DOMVS, a lesson in keeping one’s bearings in a world where temporal borders are swiftly being abolished, or at least significantly eroded.